It’s been a gray, wintry day here in Washington, DC – the kind where I am constantly refreshing my coffee and tea in an effort to ward off the chill. Winter is one of my favorite seasons, in part because of the holidays, yes, but also because I love bundling up in oversized sweaters and plopping a knitted hat with a pom-pom on my head. 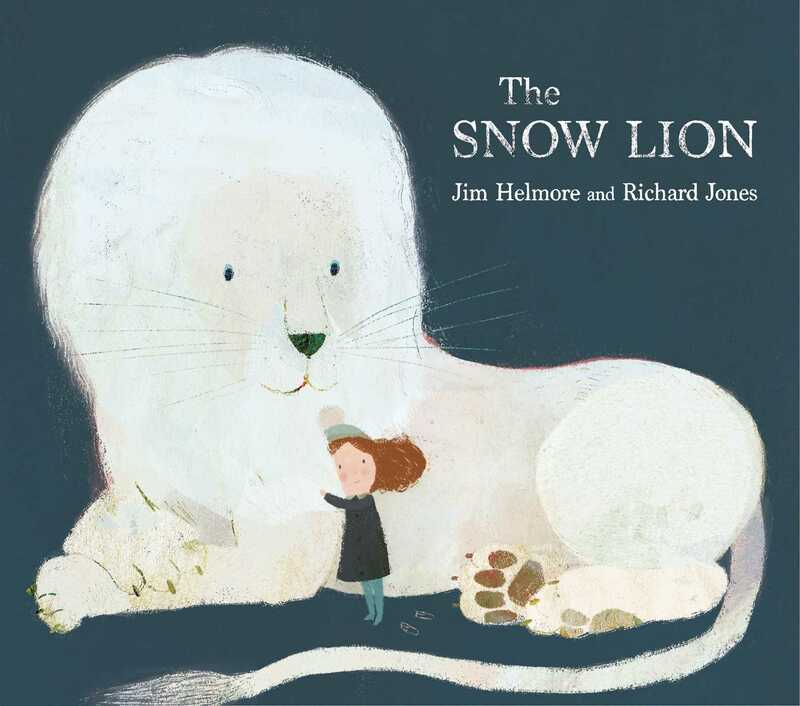 Caro, the heroine of Jim Helmore and Richard Jones’ The Snow Lion, dresses like I do in winter, and that was just one of the things to love about this quiet, beautiful picture book. After moving to a new home, Caro wishes she had a friend, but she’s too shy to meet the neighborhood kids. With a little imagination, however, Caro finds the Snow Lion. Together, they have all kinds of fun racing, climbing, and playing hide-and-seek. But when the boy next door asks Caro to come play, Caro isn’t so sure. Then, the Snow Lion has an idea! Making new friends isn’t always easy, but it is always worth it in the end. This powerful but gentle story about making new friends is gorgeously illustrated to celebrate the magic and imagination that fills every page and will appeal to any shy or lonely young reader. Caro and her mother have just moved, and everything in their new house is white, white, white! It would seem a little lonely and soulless, except that almost immediately Caro meets a Snow Lion. This Lion blends in with the white walls, helps her explore her new home, and encourages her to be brave and reach out to make new friends. Soon Caro’s life is full of color and friendship! The Snow Lion is a sweet, simple, and sincere story about loneliness, taking leaps of faith, making new friends, and remembering the old ones. Though the Snow Lion is never named as such, it is an imaginary friend (but as anyone who has had an imaginary friend knows, that doesn’t make them any less real!). I liked that it was never called out in the text, because I think it will make sense to children who already daydream, and open the imaginations of those who don’t so much. Another thing to love is the way that Helmore has framed Caro, a naturally shy character (in a new setting, to boot! ), in a dynamic and positive light. The focus is not on being left out (which I’ve seen many times in picture books and is fine for what it is! ), but on finding ways to play with what you have, and then later on being courageous, reaching out, and making friends. The art! When am I going to get to the art?? Well, as you must be able to tell from the cover, Richard Jones’ mix of paint and Photoshop illustrations are simply lovely. Jones has an eye for patterned, geometric details, and while the palette is at first very muted (all that white! ), color and texture gradually seep in as the world opens up for Caro. I really adored the illustrations and would happily open this book again and again just for those. I also desperately hope that there are stuffed, all-white lion toys somewhere out there in the world to pair with this book. That would be sticky-sweet. And! On a final note, the endpapers, which are a cool silver-and-white pattern! They should be made into wrapping paper. I’d buy at least 2 rolls. Overall, The Snow Lion is quietly delightful – a good book for wintry days. Recommended for: readers ages 3 and up, for storytimes and one-on-one reading, and especially for shy little ones (or those who’ve just faced a big change). Fine print: I received copy of this book for review consideration from the publisher. I did not receive any compensation for this post.